India’s transmission sector has witnessed high growth rates in recent years, driven mainly by the government’s initiatives such as ‘One nation, One price and One grid’ and ‘Power for All’. 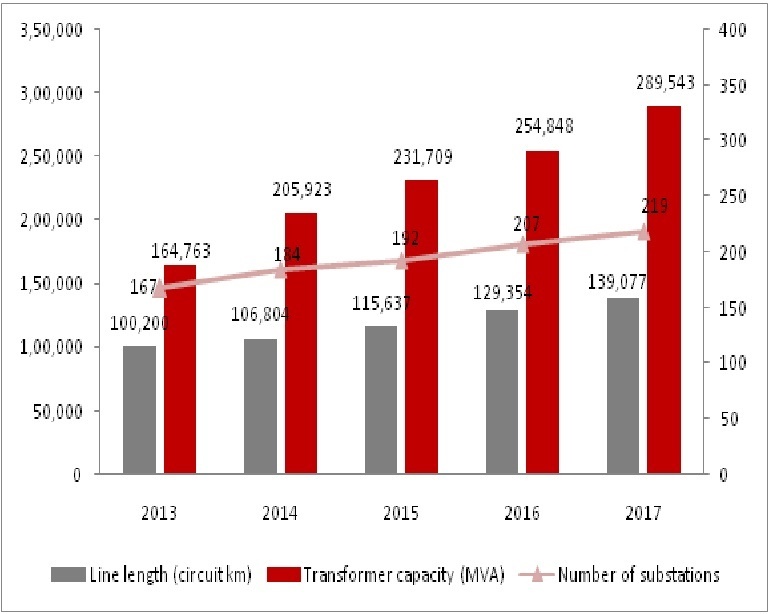 In the past five fiscal years (April 2012-March 2017), the country’s transmission network (220 kV and above) grew by a compound annual growth rate (CAGR) of 7.6 per cent while the transformer capacity grew by a CAGR of 12.7 per cent. Recently, the country’s ranking in terms of electricity accessibility (global level), moved up from the 99th spot in 2014 to the 26th spot in 2016. India’s federal utility Powergrid Corporation of India Limited (POWERGRID) is leading the sector’s expansion. With a line network of around 290,000 circuit km, POWERGRID is the country’s largest high voltage network owner and developer. The company transmits around 50 per cent of the power generated and owns around 85 per cent of the interstate transmission system (ISTS) network. In addition to its role as a developer, it functions as the country’s central transmission utility (CTU) responsible for the planning and coordination related to developing ISTS projects. With various initiatives and programmes such as green energy corridors, smart technology projects, and indigenous development of 1,200 kV ultra high voltage (UHV) technology, the company is revolutionalising the country’s transmission sector. Over the past few years, POWERGRID has made significant progress in increasing its transfer capacity and transmission network. Its inter-regional transfer capacity grew at a CAGR of 26 per cent from 29,750 MW in 2012-13 to 75,050 MW in 2016-17. Since 2012-13, POWERGRID’s line length has grown at a CAGR of 8.5 per cent.As of March 2017, POWERGRID’s transmission line length stood at 139,077 circuit km, an increase of approximately 7.5 per cent over the 129,354 circuit km in the previous year. Nearly 90 per cent of the company’s line length is at voltage levels of 400 kV and above. The transformer capacity of the company increased from 254,848 MVA in March 2016 to 289,543 MVA in March 2017, recording a growth of 13.6 per cent. During the 2012-17 period, the transformer capacity grew at a CAGR of 15 per cent. Meanwhile, the number of substations increased from 167 in 2012-13 to 219 in 2016-17, marking a CAGR of 7 per cent. The utility is the only company to develop 800 kV high voltage direct current projects (HVDC) in the country. It recently completed the 6,000 MW, ±800kV Biswanath–Chariali–Agra HVDC bipole line, which is the longest HVDC transmission system in the world. As a result, the cumulative inter-regional power transfer capacity of the national grid has been enhanced from 57,450 MW to 75,050 MW (an approximately 30 per cent increase) during FY2017. It is also a leading player in the tariff-based competitive bidding (TBCB) segment, with a portfolio of 11 projects. In FY2017, POWERGRID won the Strengthening Scheme in Eastern Region (ERSS-XVIII) project, one of the largest projects offered under TBCB. Further, in September 2017, POWERGRID won thecontract for the Eastern Region Strengthening Scheme-XXI project under TBCB bidding, involving the establishment of three new 400 kV substations and associated 400 kV transmission lines in Bihar.So far, the utility has completed three projects, namely, the recently commissioned 765 kV Gadarwara steam-based thermal power station (STPS)–Jabalpur Pool double-circuit transmission line, which is a part of the larger project, Transmission System Associated with Gadarwara STPS (2x800 MW) of NTPC Part A; the System Strengthening in Southern Region for Import of Power from the Eastern Region project; and the Associated Transmission System of Unchahar Thermal Power Station project. Note: Data is for fiscal years ending in March for the respective years. POWERGRID’s transmission system availability stood at 99.79 per cent as of March 2017. The company has been able to consistently maintain a network availability of over 99.7 per cent throughout the five fiscal years, 2013-2017. Though POWERGRID’s trippings per line increased marginally from 0.66 in 2016 to 0.68 in 2017, the availability of its transmission system increased from 99.72 per cent in 2016 to 99.79 per cent in 2017. POWERGRID’s revenues stood at INR265,815 million in the financial year (FY) ending March 2017, recording a growth rate of 25 per cent over the revenues of INR212,433 million in 2016. Since FY13, its revenues have grown at a CAGR of 18.8 per cent. During the same period, the profits increased at a CAGR of 15.4 per cent, closing at INR75,202 million in FY2017. The revenues earned by the transmission business in 2017 accounted for 93 per cent of the total revenues earned by the company, leaving marginal shares for consultancy (2 per cent), telecommunication (2 per cent) and other businesses (3 per cent). The company’s operating expenditure grew at a rate of 20.4 per cent during 2016-17, increasing from INR23,880 million in FY2016 to INR31,150 million in FY2017. POWERGRID has been incurring heavy capital expenditures since March 2012, as is evident by the 30.4 per cent CAGR of the same over the FY13-FY17 period. The company spent INR244,290 million in capital expenditures in FY17, an increase of 8.2 per cent over the INR225,840 million spent in FY16. Thecompany’s debt to equity ratio fell from 3.07 in 2016 to 2.91 in FY17. Since FY13, POWERGRID has been able to consistently maintain a debt to equity ratio of less than 3.1. POWERGRID is undertaking various initiatives to expand the country’s transmission sector and to increase its efficiency. It has initiated the implementationof high capacity Green Energy Corridors (GEC) in eight renewable resource-rich states in the country for the large-scale integration of renewable energy resources into the national grid. The company has been performing a crucial role in the evacuation of power from various ultra-mega solar parks through the inter-state transmission network. POWERGRID is also involved with setting up Renewable Energy Management Centres (REMC) in renewable resource-rich states to facilitate the forecasting of renewable resources and ensure greater efficiency in the management of variable renewable generation, thereby ensuring grid stability and security. POWERGRID is currently implementing several HVDC projects. These include the 6,000 MW ±800 kV Champa–Kurukshetra line and 6,000 MW ±800 kV Raigarh–Pugalur line and the 2,000 MW ±320 kV Pugalur–North Trichur line. It is also considering the implementation of a 1,200 kV AC system and has successfully commenced power flow through the 1,200 kV National Test Station in May 2016. The company is also working on the construction of several electrical interconnectors with neighbouring countries like Nepal, Bhutan and Bangladesh, to strengthen and increase the transmission of power between these countries and India. Some of the upcoming and planned interconnections are listed in the table below. POWERGRID has been involved in the application of intelligent technologies towards the development of smart grids. It is focusing on enhancing its abilities by undertaking in-house research and demonstration projects in the fields of smart gridsand energy efficiency. The company is closely associated with the implementation of a smart grid at Varanasi and Gurugram as part of the government’s endeavour to develop smart cities. Simultaneously, POWERGRID is exploring new opportunities for developing charging infrastructure for electric vehicles andis venturing into various smart city projects. Additionally, POWERGRID has signed a memorandum of cooperation with the Norwegian Centre of Expertise (NCE) – Smart Energy Markets, which envisages cooperation between NCE, Norway and POWERGRID to work in the fields of smart grids, capability development and other related areas. POWERGRID is at the forefront of adopting modern technologies and conducting in-house research for technology excellence in the power transmission sector. To minimise transmission losses, POWERGRID is exploring superconductor cables for transmission, which ensure almost lossless transmission. For route selection and length optimisation of transmission lines, POWERGRID has employed modern survey techniques.It is also implementing process bus technology in substation automation systems. POWERGRID is making effortsto switch to high performance conductors in both existing and new lines to reduce the sag levels. The company is also planning to undertake a demonstration project on a High Temperature Superconductor (HTS) cable system to assess the associated feasibility and operational issues. POWERGRID has established its footprint in 20 countries. Currently, it is undertaking around 14 projects across various countries. During the fiscal year 2016-17, POWERGRID signed a contract with Fiji Electricity Authority for the consultancy assignment to design and prepare the tender specification for the construction of a132kV transmission line, 132kV switching station and 132/33kV substation in Fiji. The company has also signed a memorandum of understanding (MoU) with Abu Dhabi Water & Electricity Authority (ADWEA), under which POWERGRID will cooperate with ADWEA and its group companiesto work in several areas including smart grids, EHVtransmission technologies, etc. Over the next five years (by March 2022), POWERGRID plans to invest INR1,300 billion on the expansion of the country’s grid network, of whichINR1,050 billion will be spent on ongoing projects, INR50 billion on new projects and INR200 billion on TBCB projects. In the coming three years, POWERGRID will incur a capital expenditure of around INR910 billion on the projects already secured. In an effort to expand its business overseas, POWERGRID is planning to bid for transmission concession contracts in Brazil in the upcoming auction slated to take place in December 2017. It plans to bid for two to three lots out of the 11 lots being tendered by the Government of Brazil. In addition, POWERGRID is open to similar opportunities in other countries, such as Myanmar, Sri Lanka and other Southeast Asian countries. POWERGRID still holds the majority share in the electricity transmission market in India and is looking to expand its base globally. Given the efforts of the Ministry of Power to separate the CTU status from POWERGRID, the company will have to face a lot of changes in the future.